UPDATE 1/31/19: WSDOT has officially announced the SR 99 tunnel opening will be on Monday, Feb. 4. Half way through week three of Viadoom and we’re happy to report that everything is mostly on schedule. 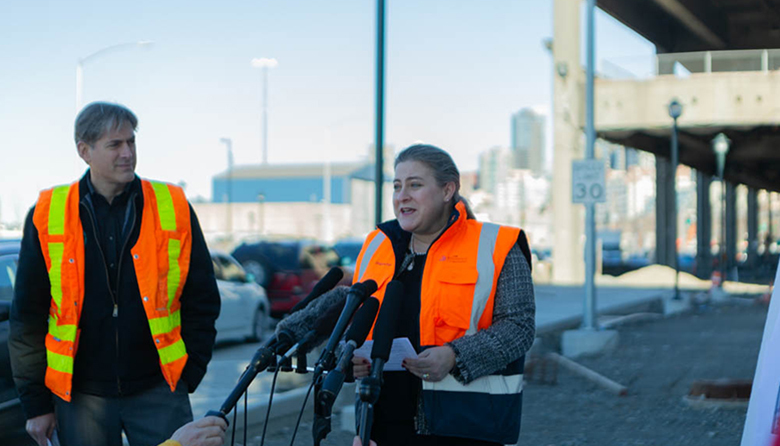 At yesterday’s media tour near South Dearborn St., WSDOT discussed the progress of the State Route 99 tunnel. Traffic remains very un-apocalyptic and more people are taking public transportation. King County Metro released official numbers last week for the water taxi, announcing that ridership had tripled. Larger delays have mostly been blamed on poor weather and traffic accidents. As for our editorial staff’s pessimism regarding the tunnel opening on time, WSDOT says that Monday, February 4 remains the target opening day, but an official announcement will be made in a few days. Construction crews are still working to lay down asphalt and lane dividers at the south and north entrances, but the transportation authority says the work is on schedule and any delays from this point will be weather dependent. Driving through the tunnel will be free until tolling begins this summer. SDOT warned that traffic is not expected to go back to normal due to continued delays at the tunnel’s exit points. The Battery Street Tunnel closes forever on Friday. If you’re travelling this weekend, plan ahead. If you’re coming from West Seattle, off and on ramps won’t be completed when the tunnel opens. Expect Viadoom to carry over for a week at minimum. To make the best, most efficient use of SDOT and Metro services during the rest of Viadoom—and beyond—they encourage users to check out their how-to videos and blogs, and even have a walkthrough of one of the toughest transportation trials: putting your bike on the front of a bus. “In 2024 we’ll all look back at this and laugh,” SDOT director of downtown mobility Heather Marx said.